The art of putting flowers in a vase or container of water is actually believed to have come from the orient. The Chinese were among the first civilisations of the world to believe you could do something other than braid or make wreaths and swags with flowers! So while the rest of the world was busy scattering petals and herbs, Asia was creating marvellous display which wouldn’t look out of place today. Japan in particular developed the use of cut flowers to reflect mood, beliefs and philosophy. It became an art which went far beyond being just merely decorative. Instead it symbolised devotion to the Gods and meditation.Asia was a lot luckier than the rest of the world all those centuries ago and before the days of importing because it had some of the most beautiful natural growing flowers in the world. A huge variety of orchids, lilies, ornamental grasses and bamboo which were readily available then have transcended the years and are available now. There are very few displays these days without lilies and orchids! 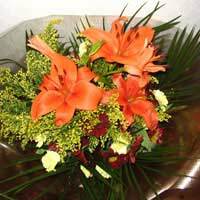 They are readily available in florists and supermarkets and add colour and sophistication to many designs.Tall, elegant lilies look amazing just buy themselves in a glass vase as do orchids whose beauty can stand alone without any help from other flowers. Orchids in particular look so delicate and exquisite when in fact they are incredibly hardy and perfect for even the smallest and most intricate of displays such as a corsage or handbag spray. Bamboo is fabulous by itself in tall test tube vases – incredibly trendy these days, as are ornamental grasses. A true oriental display is not just about the type of flower you use – they don’t necessarily have to come from Asia and you can get the same effect from cheaper varieties. It’s more about how it looks. Oriental displays are generally linear and unfussy. The important thing to always remember is to keep your arrangement linear if you want to create a true oriental display. This design alternates tall stems with flowers or foliage at the base. Bunch of rose; bunch of tulips; three stems of hypericum berries; two stems of small headed chrysanthemums; two stems of larger headed chrysanthemums; ivy; hard ruscus; any large dark leaves; bamboo or curly sticks; floral foam; tray; pot tape; frog; fix. Lay out all your materials – make sure any thorns are removed from the rose stems and the leaves are removed from the other flowers. Secure a frog onto the plastic tray with fix. Wet your floral foam and place on top of the frog. Round off any edges on the foam and secure onto the tray with pot tape from one side to the other and repeat. Start by place your taller material. Place the bamboo or curly sticks at the back of the foam, if using sticks, tie them together with wired raffia. In the spaces between the tall flowers, from back to front of the foam across the top add low level rows of the different chrysanthemums. Fill in around the edge with sections of ruscus and ivy and for added interest why not curl a few large leaves and put them in. You do this by stapling the leaf together after you roll it and wiring the stem to anchor it into the foam.